Number: A numeric representation of a quantity. A number is a representation of a quantity. A quantity answers the questions, "How many?" and "How much?" How many ways can you think of to represent 3? Each digit of a number has a place value. The position of the digit in the number tells the place value. For the decimal numbers, the place values are multiple of 10. Figure 2 shows a number without a decimal point. This means that the digit on the extreme right of the number has a place value of 1. The total value of the digit is 4 · 1 = 4. The digit following to the left is '7'. The place value of this digit is 1 · 10 = 10. The total value of the digit is 10 · 7 = 70. The digit to the left has a place value of 10 · 10 = 100. The total value of the digit is 3 · 100 = 300. The value of the number in figure 2 is 300 + 70 + 4. Figure 3: Digits and place value to the right of the decimal point. In figure 3, number 3.682 has a decimal point. The digit to the left of the decimal has a place value of 1. The digit to the right of the decimal has a place value of 1/10. Each digit further to the right of the decimal point has a place value of 1/10 of the previous digit. So the 6 has a total value of 6 · 1/10 = 6/10. The following digits have values of 8 · 1/100 = 8/100 and 2 · 1/1000. The value of the integral number is 3 + 6/10 + 8/100 + 2/1000. Figure 4: Parts of a number. 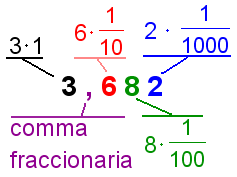 A number can consist of digits, a decimal point, a positive or negative sign (+ or -), and a comma separator. Quantities have been represented in many ways. One way that was in early use was hash marks. Each line counts as one. In the example in figure 5, there are seven lines. So the quantity represented is seven. Figure 6: A notched bone, which may have been used as a musical instrument or a counting device, was found in an Early Bronze Age (2900 B.C.) grave at Kenan Tepe, Turkey. Sticks and bones have been found at archaeological sites with notches cut in them to make hash marks. Hash marks have several problems. Zero can not be represented by hash marks. Also, very large numbers are awkward to represent with has marks. Only natural numbers can be represented by hash marks. Brass counters and Counting boards were used to calculate numbers before calculators were invented. 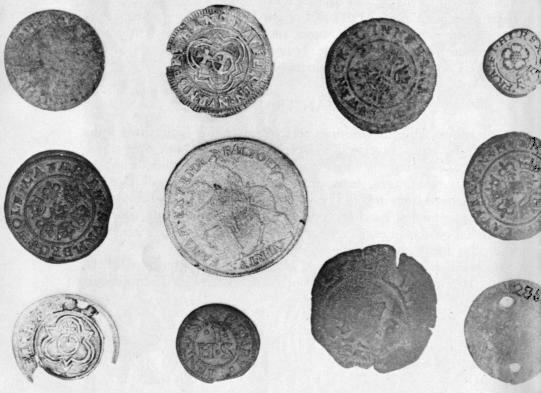 Figure 7 shows brass counters used at Jamestown. Figure 7: Brass counters excavated from Jamestown. Numbers have evolved as the best way to represent quantities. They can represent positive numbers, zero, and negative numbers. They can represent very large and very small numbers. They can also represent non-whole quantities such as 1.5. The only thing numbers can not represent exactly is irrational quantities. The digits in irrational values go on forever without repeating, so an irrational value can not be represented with a finite number of digits. Other representations such as π and √2 are used to represent irrational numbers exactly. Mathematicians have divided numbers into groups according to their properties. Figure 8 is a Venn diagram of number types. The group of complex numbers contains all other groups of numbers. All numbers are complex numbers. Table 2 gives the properties of the types of numbers. Rational Number ℚ A rational number is a real number that can be expressed as the ratio of two integers. A number with a repeating decimal is a rational number, as all repeating decimals can be expressed as a ratio of integers. All rational numbers are also real numbers. Stated mathematically: ℚ ⊂ ℝ. 4 Why? 0 - multiplication by For any real or complex number a, a·0=0·a=0. 0 - division by Division by zero is undefined. 1 - multiplication by For any real or complex number a, 1·a=a·1=a. Absolute value The absolute value of a number is the distance of a number from zero. If a≥0, |a|=a. If a<0, |a|=-a. Addition Addition is combining two numbers to form a sum. Addition of real and complex numbers is associative, commutative and closed. Additive identity The additive identity for real and complex numbers is 0 since, for any real or complex number a, a + 0 = 0 + a = a. Additive inverse For all real and complex numbers a, the additive inverse of a is -a.
Axiom of Archimedes There is always at least one more number. For every x∈ℜ, there exists a number n∈ℜ such that n>x. Division by 0 Division by zero is undefined. Equality Equality is a property that two numbers are either equal to each other or not equal to each other. Equality of numbers is symmetric, reflexive and transitive. Multiplication Multiplication is repeated addition. a·b = a+a+a+...+a b times. Multiplication of real and complex numbers is associative, commutative and closed. Multiplicative identity The multiplicative identity for real and complex numbers is 1 since, for any real or complex number a, a·1 = 1·a = a.
Multiplicative inverse For all real and complex numbers a, the multiplicative inverse of a is 1/a. Ruler Postulate The Ruler Postulate defines the association of the real numbers with a number line. Composite number A composite number is an integer greater than 1 that has factors other than 1 and itself. Factorial The factorial of n is the product of all integers from 1 to n, inclusive. Fibonacci numbers The Fibonacci numbers are a sequence of numbers starting with 0, 1. After the first two numbers, each number in the sequence is calculated by adding the two previous numbers. Googol A googol is a very large number. 1 googol = 10100. Googolplex A googolplex is an extremely large number. 1 googolplex = 10googol. Prime number A prime number is an integer greater than 1 that is divisible only by 1 and itself. McAdams, David E.. Complex Number . allmathwords.org. Life is a Story Problem LLC. 3/12/2009. http://www.allmathwords.org/en/c/complexnumber.html. McAdams, David E. Number . 12/21/2018. All Math Words Encyclopedia. Life is a Story Problem LLC. http://www.allmathwords.org/en/n/number.html. Notched bone: Bradley J. Parker. Unknown. Brass counters: John L. Cotter and J. Paul Hudson. Released into the public domain.